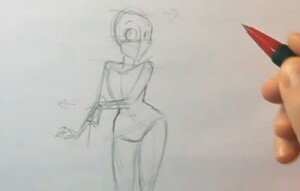 To learn how to draw a pose, start by doing a few thumbnails to create the outline of the face and body. Here we are just trying to get the initial shape and decide which direction our pin up girl is looking in.Because you’re drawing a pose, you won’t want it to look too much like a cartoon, but real and genuine instead. You will want to determine how your pin up is posed as well as the initial positioning. Remember, this is just the first pose you’re going to try out, so it’s always a good idea to go through a few different ones before picking which one you’d like to take to a completed drawing.To create the arms and to position the head on the body create flowing lines. You may want to have the girl looking in one direction while her arms and heading the other way. This will create a more open look at the body exposing more of the curves and the tiny waist expected from a classic pin-up style drawing.For the next part of your pose, you will want to create a look of the pin up being seductive. In order to do this, it’s often a good idea to have her performing an action. Here she is putting on gloves to create that effect. You will also want to look at how her eyes are positioned. In this pose she will be looking back over her shoulder to see who is paying attention to her.Make sure to sharpen the lines and to create the general shape completely here. 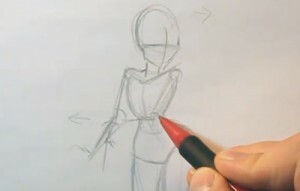 You now have the full outline and the basic model when you are drawing a pose and you are creating that sultry look, without being too provocative.